Steven P. Miller Endowed Chair and Professor Whites; Professor Sohraby; Associate Professors Montoya, Tolle, and Anagnostou; Assistant Professors Zhao, Zhang, and Hoover; Instructor Linde and Rausch. The mission of the graduate program in electrical and computer engineering graduate program is to provide quality student learning at an advanced level and to disseminate new knowledge in electrical engineering, while at the same time working to increase resources in support of these objectives. The graduate program in electrical engineering consists of research and study leading to the master of science degree in electrical engineering (M.S. EE) and multidisciplinary Ph.D. degrees in materials engineering and science, nanoscience and nanoengineering, and biomedical engineering. In special cases, with the consent of the graduate committee of the electrical and computer engineering department, students may elect to do research in association with another engineering or science department. The prospective student should have completed a baccalaureate degree in electrical engineering or computer engineering. Applicants from universities that are not accredited by the Accreditation Board for Engineering and Technology (ABET) are generally required to submit Graduate Record Exam (GRE) scores from the General Test with their application. Depending on the student’s undergraduate background, and at the discretion of the electrical and computer engineering graduate committee, graduates of other institutions may also be required to take one or more courses of preparatory undergraduate work in addition to their graduate program of study. 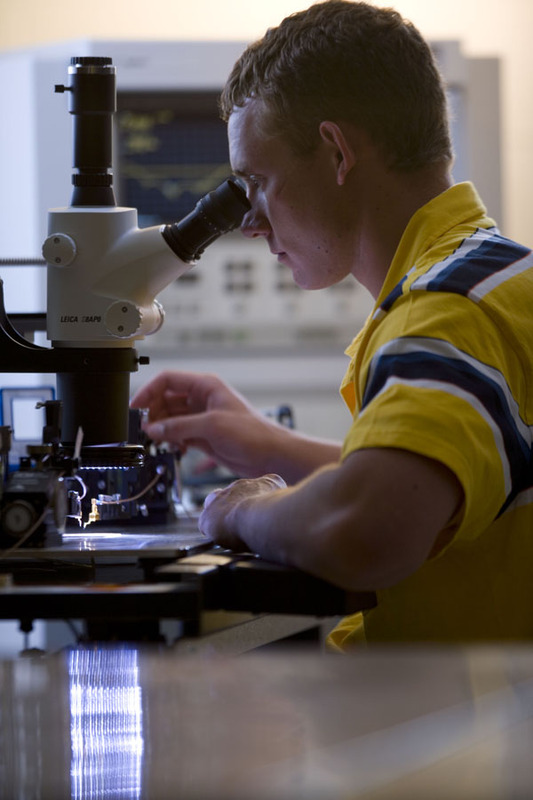 A student may pursue a Master of Science in Electrical Engineering (M.Sc. EE) via one of the following three options: (i) M.Sc. with thesis, (ii) an accelerated M.Sc. (for SDSMT undergrad only), or (iii) a M.Sc. non-thesis (a course work only) degree. The student must focus within one of the following discipline focus areas, as well as complete the specified requirements for the chosen degree option given below. The courses for each area of focus are listed in Section H. Section A describes the detailed requirements for each of the M.Sc. EE degree options offered by the Electrical and Computer Engineering Department. Sections B-G describe additional department requirements, policies and capabilities. The thesis M.Sc. EE degree consists of a program of graduate course work and thesis research. Candidature for the M.Sc. EE degree with thesis is contingent on an aptitude to do research and/or development. A limited number of students are accepted into the M.Sc. EE thesis option, on the recommendation of a major professor. Teaching and research assistantships are normally reserved for thesis students. Upon commencement of this program, transfer from a M.Sc. EE thesis degree program to a non-thesis degree would require additional approvals from the student’s existing major professor and department head, and usually is not granted. A program of at least 30 credit hours of course work and research approved by the student’s major advisor and committee. No more than 15 credit hours (included in the 30 credits required for graduation) can be taken at the 500 level or below (i.e. additional classes should be taken at the 600 level or above). At least 6 credit hours, but no more than 9 credit hours, of thesis research may be included in the 30 credits required for graduation. A satisfactory thesis based upon individual research and development. Meeting or exceeding prescribed ECE and graduate program academic standards. 4 courses within focus area, from the set specified in section G.
2 courses outside one’s focus area but within the discipline of Electrical and Computer Engineering- also specified in section G.
2 courses outside of the discipline of Electrical and Computer Engineering. The accelerated M.Sc. EE degree consists of a program of graduate course work and a significant engineering project resulting in a project report and/or a peer-reviewed conference or journal paper. This degree is meant as an honors type of degree available to SDSMT students in good standing at the beginning of their junior year, i.e., a student with a GPA 3.0 or above within ECE related course work. Students desiring to be a part of the program need to apply to the M.Sc. EE graduate program at the beginning of their junior year and be accepted into the M.Sc. EE Accelerated option graduate program. The student must also be accepted into a focus track before taking any classes counted towards their master degree, i.e. obtain a major professor that will mentor their project research within a focus track. These degree students are normally not supported by the department via teaching or research assistantships. However, as an undergraduate student they may qualify for any available undergraduate scholarships. It is encouraged that the student aligns senior project with graduate research project. The degree is designed to allow the student to complete both their B.Sc. EE or B.Sc. CENG, and their M.Sc. EE within a five-year time frame. The student’s engineering project is meant to be completed during the summer between the senior and graduate year and/or the summer just after their graduate year, if needed. Students in this program are assumed to be able to complete their B.Sc. and M.Sc. degree requirement in 5 years. EE 465 Senior Design Project II Credits: (0-2) 2 Senior Design II topic selected should have some Applied EM component (not necessarily focused 100% on Applied EM). Counts towards EE 788 and EE 798 5 credit limit within degree. # Courses MUST be taken at 500-level. * Lab credit not double-counted. ** In the future, EE 547 will replace this course. # Course MUST be taken at 500 level. * Lab section not taken. ** Planned curriculum change requests. At least 4 credit hours of project research must be part of the candidate’s program of study, i.e. EE 788 Master’s Research Problems/Projects . (No more than 5 credit hours of project research may be applied to the degree requirements. This limit includes any EE 465 credits that are double counted.) These credits are generally taken during the summer between the senior year and graduate year as well as the summer following the graduate year. A student must prepare, submit, and have accepted a completed project report and/or have an accepted peer-reviewed conference article based upon the individual’s research and development contributions under the direction and collaboration of their major professor, with their major professor’s approval. No more than 16 credit hours (included in the 32 credits required for graduation) can be taken at the 500 level (i.e., additional classes should be take at the 600 level or above). No more than 9 credits may be taken from outside the ECE department and count towards the 32 credits to graduate. The student must meet or exceed the prescribed academic standards by the department and the graduate school. 4 courses from the “common” courses prescribed above (one of these might be double counted within the focus track). 1 course outside of the discipline of Electrical and Computer Engineering 4-5 credits of EE 788 (includes any double counted EE 465 credits taken as part of a track above). The non-thesis M.Sc. EE degree consists of a program of graduate course work. A project and/or research are not required and are normally discouraged for the M.Sc. EE non-thesis option. These degree students are normally not supported by the department via teaching or research assistantships. # Course MUST be taken at the 500 level. In addition to the required common courses, the candidate’s program of study must focus within the field of electrical engineering by including a depth of at least four courses within a focus area listed in section G (as in the accelerated program). No more than 12 credits may be taken from outside the ECE department and count towards the 32 credits to graduate. No more than 3 credits of EE 788 Master’s Research Problems/Projects , may be counted towards the 32 credits to graduate. Meeting or exceeding prescribed academic standards by the department and the graduate school. Students whose native language is not English are generally required to take the Test of English as a Foreign Language Test (TOEFL). Graduate students with a TOEFL score below 560 are required to attend a remedial course in English. Meeting or exceeding prescribed academic standards in English composition and oral presentations. Undergraduate students taking 600 level graduate courses and petitioning these courses for graduate credit should realize that application of these credits to the program of study is subject to the approval of the student’s graduate committee. A student’s graduate program will come under the control of the graduate committee at the time the student is accepted into the graduate program. The ECE Graduate Committee is the graduate committee for all M.Sc. EE non-thesis degree students, with the ECE Graduate Coordinator or designee serving as the advisor. M.Sc. EE thesis and accelerated students must form a graduate committee with a major professor who has agreed to supervise the research/project of the student. In both cases, the student must arrange to have a faculty member external to the Department of Electrical and Computer Engineering serve on their committee. Each student must submit a program of study to the candidate’s graduate committee by the end of the first semester of study within their program. Approval of the program of study is necessary in order to register for the second and subsequent semesters. The student’s graduate committee has the right to disallow any course proposed in the student’s program of study that they feel is not appropriate for a graduate degree in electrical engineering. The M.Sc. EE degree offers emphases in the areas of applied electromagnetics, antennas, and microwave, power systems and power electronics, robotics and autonomous systems, communications and networking. In addition to the more discipline-specific equipment listed below, the ECE department has well-equipped laboratories of networked PCs, general purpose test and measurement equipment such as high-speed oscilloscopes, arbitrary function generators, logic analyzers, and printed circuit board prototyping machines and software. Electromagnetic materials (development of accurate and novel materials characterization methods; artificial materials analysis, design, fabrication, and measurement; materials with tailorable properties). Antennas (electrically small antennas; miniaturization of ultrawideband antennas; reconfigurable / autonomous robotic antennas and antenna arrays; novel antenna reconfiguration methods and phase-change materials; “green” antennas on paper for security applications; resistively loaded antennas; wideband, coplanar and flexible antennas; metamaterial-inspired antennas). Artificial electromagnetic surfaces (high impedance and textured surfaces). Microwaves (Design of passive microwave components and baluns; applications of metamaterial-inspired designs for microwave components and antennas from MHz to THz). Direct-write manufacturing of electromagnetic devices (antennas and microwave frequency devices; MEMS). Resources in support of this program include an anechoic chamber, many vector network analyzers, a number of electromagnetic materials characterization systems, impedance analyzers, fast rise time pulse generators and detectors, Agilent Advanced Design System, Microwave Studio, and IE3D. In addition, the Steven P. Miller Endowed Chair in electrical engineering was established in 2001 to support telecommunications in the ECE department. Research activities in the area of controls, and autonomous robotics systems (CARS) include: unmanned systems, autonomous systems, robotics, machine control, fuzzy logic control, nonlinear and adaptive control, visual servo-ing, system identification, fault analysis, modeling of power systems, power systems stability, generator dynamics, and wind power. In addition, a number of robotics and controls projects are performed in association with the School of Mines Center of Excellence in Advanced Manufacturing and Production (CAMP) and Advanced Material Processing Center (AMP). Resources in support of this program include logic analyzers, a variety of microcontroller and microprocessor development systems, FPGA and CPLD prototyping boards, VHDL and Verilog compilers, Analog Devices DSP development tools, Mentor Graphics Computer Aided Design Toolset, Matlab/Simulink embedded coding tool sets, Kiel complier tool chains, and printed circuit board manufacturing equipment. Research activities in the area of power systems and power electronics include: the design, analysis and modeling of power system, control and protection of power transmission and distribution grids, electric machines and motor drives, design and control of power electronics converters based on semiconductor switching devices (Si, SiC, and GaN), integration of renewable energy resources (wind, solar, fuel-cell, etc. ), and applied power electronics devices in power systems. Resources in support of this program include high-voltage dc power supply, DSpace board with toolbox embedded in Matlab for hardware-in-loop experiment, electric machines, DSP control boards, power modules, various relays, and many other related equipments, tools, and software for lab research. Research activities in the area of communications and networking include problems in the physical layer, MAC, and networking layers, coding and modulation, flow and congestion control; mathematical and simulation techniques for the analysis of networks and communications systems; protocol design, performance evaluation and experimental implementation for wireless networking including cognitive radio networks, vehicular networks, wireless autonomous networks; optical and other technologies. Students wishing to pursue a Master degree in Electrical Engineering that come from non-accredited Electrical or Computer Engineering Degree programs or equivalent, i.e. programs not equivalent to US-ABET accredited ECE programs, are generally deemed deficient in basic Electrical Engineering skills and knowledge required to perform basic EE tasks at the graduate level. As such, said students will be required to complete additional undergrad classes before full acceptance into the MSEE degree program. Non-ECE undergrad students are accepted into the MSEE degree program as probationary students until they pass all of their classes listed as deficient. Deficiencies are mastered via successful completion of core competence classes. These classes must be taken by non-major undergrad students and do not count directly towards the required MSEE degree credits. They must be taken and passed with an individual grade of C or better and an overall cumulative grade of B or better within the first two semesters of a students program of study (additional details below). During this period, the student will remain on probationary status within the MSEE degree program. Additional classes may be required and listed as deficiencies depending on the student’s focus area and the student’s entering background. The formal list of deficiency classes for each MSEE student must be approved by the students’ graduate advisor (generally for thesis students) or the MSEE Graduate Coordinator (or designee) (generally for non-thesis MS students) before deficiency classes can be formally taken. Said deficiency classes will be cleared, credited and marked complete when a grade of at least a C or better has been earned for each class with an overall cumulative grade point average (GPA) of B or higher for the complete deficiency class list. Said classes will be formally recorded on the student’s undergrad transcript and their cumulative GPA of B or higher will be calculated based solely on the deficiency class list, i.e. no additional classes will be taken into account when calculating the minimum passing cumulative deficiency GPA. After the deficiency class list has been completed as described above and the student is in good standing, they will be removed from probationary status and accepted as a full MSEE degree student within the program. WES (or similar) translation of foreign transcripts is required for regular admissions within the M.Sc. EE applications. Engineering graduates from an accredited US or Canada ABET-accredited school are required to have a minimum GPA of 3.0 on a 4.0 scale (i.e., a B average is required). Likewise, international students are required to have a minimum equivalent GPA of 3.0 on a 4.0 scale. Moreover, students from a non-ABET-accredited US Canada school or from an international school are additionally required to have a minimum score of 50% on the Quantitative Reasoning section of the GRE test. In addition, to the minimums listed above, all students must submit a statement of purpose discussing why they wish to obtain a masters degree in electrical engineering at SDSMT. They must also submit three letters of reference in support of their pursuit of a graduate degree at SDSMT. A student not meeting the minimum requirements for regular admissions can be admitted under a probationary status with a minimum GPA of 2.75 on a scale of 4.0 given the additional requirements that a department faculty member agrees to serve as the students advisor. The student is then converted to a non-probationary student after passing, with a B average, at least 9 credits of approved M.Sc. EE program of study courses while attending SDSMT. A student may continue their studies within the M.Sc. EE program at SDSMT while on probation for up to 2 semesters, if the student has not cleared up the issues that placed them in probation at the end of the second semester on probation the student will be required to end their graduate work in the M.Sc. EE program at SDSMT at that time. In order to be eligible to graduate from the M.Sc. EE graduate program a student must obtain at least a 3.0 GPA on SDSMT’s 4.0 GPA scale within the classes listed on their approved program of study, i.e. the student must have a program of study GPA of B or better for graduation. Students should select their program of study classes from the list below with consultation and approval by their major advisor and/or committee or by the M.Sc. EE graduate program coordinator (or his designee) (depending on the degree option being sought). Classes not from this list maybe approved on a case-by-case basis by a student’s advisor and/or committee or by the M.Sc. EE graduate program coordinator (or his designee) (depending on the degree option being sought). # Courses MUST be taken at 500 level.